An elusive and dangerous small forward who averaged almost two goals a game in his six seasons at Princes Park, Harvey Louis Dunn made himself a footnote figure in the history of both the Carlton Football Club and the VFL/AFL, as the father of the first player to be recruited to a VFL team under the father/son rule. 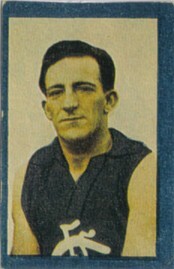 After serving his country in World War 1, Dunn joined Carlton as a 25 year-old in 1924 and forged a solid career of 71 games in guernsey number 16. He was Carlton’s top goal-scorer in his second season, and a member of Carlton’s ground-breaking Reserves Premiership team in 1926. Then, in 1951 his son, Harvey Junior, became the first individual recruited under the VFL’s new father/son rule which had been introduced to ensure that the sons of famous fathers could play at the same club. Very much a local, Harvey was born to a working-class family in North Carlton. He left school at a young age to support his family, and was a keen amateur footballer working as a butcher when World War 1 began in 1914. Harvey was anxious to join the fight as soon as possible, and badgered his parents to give their permission as soon as he turned 18. Eventually, he enlisted in May 1918, even though the end of the war and an Allied victory was in sight. After basic training, he sailed for England as part of a general draft of reinforcements, and disembarked in London three days after the end of hostilities on November 11. Although the fighting had ceased, there was much to be done. Harvey was assigned to the Australian Medical Corps, and spent the next 18 months in general duties at the First Australian General Hospital in Wiltshire. While there, he met and married a local girl, Edith Slade. Harvey and Edith returned to Melbourne in 1920, and Harvey eventually resumed playing football with Carlton District, a local amateur side with close links to the Navy Blues. He was a month past his 25th birthday when he was selected to make his debut in Carlton’s senior team against Richmond in the last round of 1924 at the Punt Road Oval. Richmond won easily, but Dunn kicked an opportunist goal and showed enough to be persevered with for the following year. In 1925, the Carlton Football Club fell into turmoil at committee level, and the dissension was reflected on the field. Three coaches and three different captains were appointed during the year, while the Blues rarely gave a yelp and ended up ninth on the 12-team VFL ladder. One of the few positives to emerge however, was Dunn’s efforts as a half-forward flanker or occasional forward pocket. Quick and instinctive around the goals, his 14 games produced 35 majors and won him the club’s Leading Goal Kicker award. Due in no small way to a potent new combination of key forwards in Horrie Clover and Harry ‘Soapy’ Vallence, Carlton climbed back to sixth in 1926. Injury and a tailing-off in form restricted Dunn to only eight senior appearances, but he finished off the year in style when he played in Carlton Seconds’ emphatic victory over Geelong in that year’s Reserves Grand Final, on Show Day at the MCG. In 1927, Dunn was fit and ready from round one, and seemed destined for a big year when he kicked five goals against Hawthorn at Princes Park on the last Saturday in May. Barely six weeks later however, his season ended prematurely when he, and St Kilda’s Stan Hepburn were both reported in the aftermath of a toe-to-toe punch up during Carlton’s big win over the Saints in round 11. As the aggressor, Hepburn was suspended for 12 weeks by the tribunal, while Dunn was given eight weeks off for retaliating. Harvey recovered from that setback to enjoy his most productive season in 1928. He didn’t miss a game, and booted six goals in a fine individual effort in Carlton’s 3-point loss to Collingwood at Princes Park in round 7. Carlton wound up fourth on the ladder, and Dunn at last experienced the thrill of his first VFL Semi Final – even though the Blues were no match for Richmond in front of 66,000 spectators at the MCG. Dunn's swansong year of 1929 went one step further, only to end in a similar way. His consistency in 18 matches brought 29 goals, and a Semi Final victory over St Kilda. But a week later, Richmond confirmed their supremacy over Carlton in a hard-fought and physical Preliminary Final battle. Dunn kicked two goals in his last match for the Blues, while feisty rover Tommy Downs was reported for striking and later outed for 19 matches. Ten years after Harvey’s last appearance for the Blues, the world was plunged into the horrors of World War II, and he once more volunteered for military service. Although he was restricted to homeland duties because of his age (he was 42 on enlistment) he did his bit again in various supply and ordnance depots until well after the war ended in August 1945. Dunn passed away on the 12th September, 1961 aged 62. 1930 May 30, The Age reported that H. Dunn had been cleared to Prahran. Fifteen years after retiring from League football, Harvey Dunn played in North of the Yarra side vs South of the Yarra in a patriotic match. "Harvey Dunn, (who still plays in Sunday matches), was applauded for two beautiful place-kick goals, a lost art to present-day players." Horrie Clover and Ernie McAlpine also played in this match. Contributors to this page: blueycarlton , Bombasheldon , molsey , PatsFitztrick , tmd1 , true_blue24 , dgreen2 and admin . Page last modified on Monday 15 of December, 2014 16:55:42 AEDT by blueycarlton. 1973 2nd Semi - Blues easily defeat Magpies. 1973 - Ex Blue Smith back (12/05/73).